Savory bread puddings can render a few funny looks, but this Leek and Fennel Bread Pudding couldn’t be a more appropriate addition to a family style dinner (I made it both for Thanksgiving and Christmas). The first time I made it, I followed Thomas Keller’s recipe to the very last sage leaf. And trust me, it did the trick. I let the leeks steam under a parchment lid, carefully toasted my brioche (Whole Foods makes an excellent one if you don’t have an extra day to make this recipe), and used his exact measurements. But we did notice a couple of improvements to be made- namely that there could have been more leeks. So the second time I made this recipe, I doubled the leeks. And why not? Leeks are a delicious little savory treat, perfect with the gruyere and cream. And as an added level of substance in an otherwise decadent cream-filled bread pudding, I threw in a bulb of sliced fennel. I also tried using a challah as an alternative to the brioche. Both are sweet and eggy and somehow dense and light at the same time, so both worked for this bread pudding. The following recipe is a combination of my two attempts. Preheat the oven to 350. Slice your brioche or challah into one inch cubes and spread out on a baking sheet. Pop into the oven and let toast for 20 minutes. While the bread is toasting, slice your leeks and fennel. You only want to use the white part of the leeks and the bulb of the fennel. Slice into 1/3 inch thick slices. Place the leeks and fennel into a large bowl and cover with water. Let them soak for a couple minutes to allow the sediment to fall out into the bottom of the bowl (they are, after all, root veggies). Lift the vegetables out of the water and place them into a large pan over medium heat. The water will release from the leeks and allow them to start steaming. After 5 minutes, add the butter and stir. Create a parchment lid (the second time around, I didn’t have parchment so I just used a lid- the world didn’t end) and set on top of the mixture. Reduce heat to medium low, add a bit of salt, and let cook, stirring occasionally, for 25 minutes more. While the leeks are simmering, whisk eggs, milk, and cream in a large bowl to create the custard. When the custard is made and the brioche is toasted and the leeks are soft, it’s time to combine them all. Toss the leek mixture into the bread cubes and add ½ cup of shredded gruyere cheese. Pour out into a 9×13 baking dish and pour 2/3 of the custard over the mixture. Press down to be sure that the bread soaks up the custard, then let sit for 10 minutes. Pour the remaining mixture over the bread and add the rest of the gruyere. Sprinkle with salt and pop into the oven for 80-90 minutes. 1. While one Hungry Texan made the pilgrimage back to Houston this Thanksgiving, the other ventured to the Big Apple, where MakerBot is revolutionizing the way we think about…all of the things. The 3-D printer made this bracelet before our eyes and is currently producing a 3-D bust of my face! Best Christmas presents ever? 2. Best Fried Pickles + Belly Laughs = The Perfect Friday night. We hopped over to our neighborhood Wonderland Ballroom on Friday for Don’t Block the Box, a hilarious stand up show. This one took us back to those Boy in the Bubble days in College- it’s a must see! 3. I ate a Tal Bagel every morning for 5 days in NYC. Don’t judge me. They are that good. 4. This is the real-life herb section at Central Market, the H-E-B owned grocery store that has taken over Texas and will forever be these Hungry Texans’ model for grocery excellence. Can we get one in DC, pretty please? 5. Only in Texas can a Santa-Suit wearing, pirate pants donning, booted cowgirl steal the show at The Nutcracker. 6. What’s better than a can of Texas-brewed Lone Star? A camouflaged tall boy, of course. Only 365 days until Thanksgiving. But who’s counting? 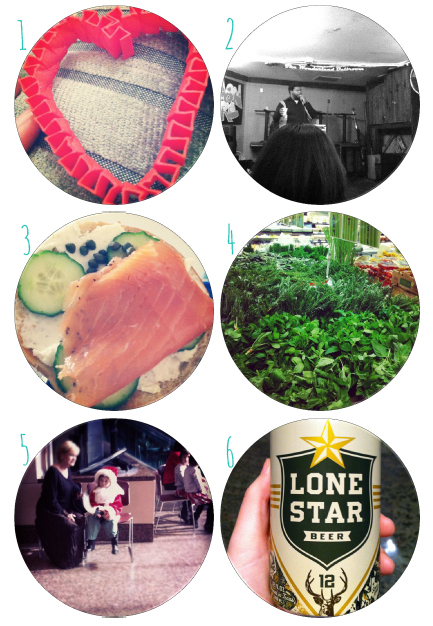 a hungry texans guide to thanksgiving! we all do it- that weekend before thanksgiving when friends gather, drink too much spiced cider, and potluck our faces off for that pre-thanksgiving thanksgiving celebration. call it Friendsgiving or Fakesgiving, we just call it delicious. and this year was no different. the man chefs brought their extremely tasty green beans and a rendition of thomas keller’s stuffing that blew us meat eaters’ socks off (vegetarians beware: this stuffing starts with 1 lb of rendered bacon fat). use these recipes for your own thanksgiving feast or just as side dishes for a wonderful meal. click through for recipes! The irony of this cranberry relish (and many, many things I’ve now come to love) is it disgusted me for the first 15 years or so of my life. Thanksgiving dinner for this HungryTexan meant the blandest of plates. Turkey, mashed taters, dinner rolls. What about the dressing, gravy, sweet potatoes and cranberry relish? Yuck! Yuck! Yuck! and extra Yuck! so thought the tastebuds of a tinier Texan. Little by little my tastebuds matured and I learned the wonders of a more colorful Thanksgiving plate. 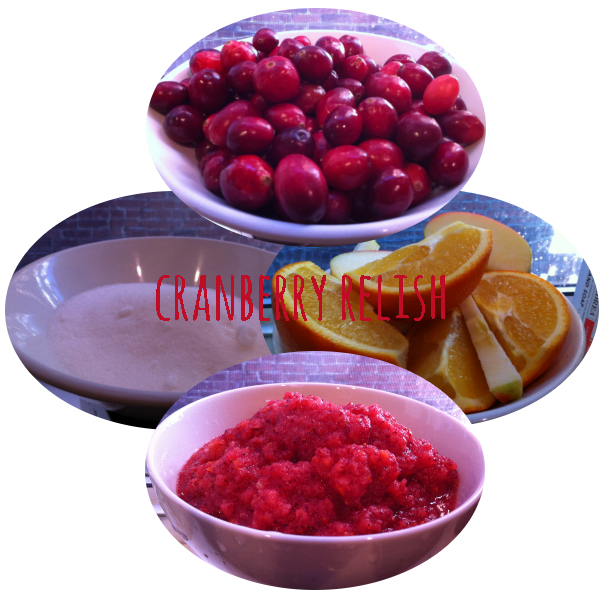 I warmed to the cranberry relish last, but it’s since become one of my all time faves and it couldn’t be simpler. Slice your apples & oranges (keep the skin on!) and remove the seeds. I’d cut ’em a tiny bit smaller than the slices pictured above. 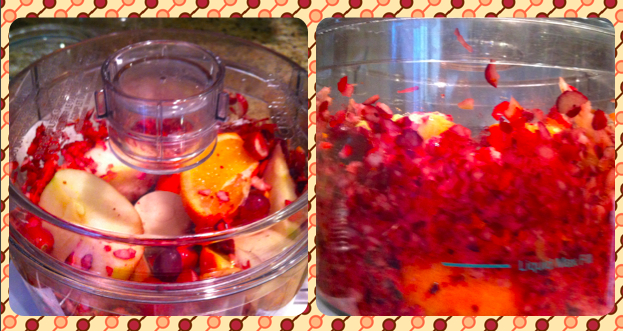 Dump your cranberries, apples, and oranges into your food processor until all your fruits are pulverized. Then add your 1/2 cup of sugar and process it all together. You’ll be (cran)berry, berry happy you spent the 15 minutes to whip up this classy condiment for any Thanksgiving spread. It’s the perfect pop of color for any plate & a sweet-tart pop of flavor for your palette. Also, make this a few days in advance — it only gets better with age! Cauliflower is such a versatile and easy ingredient. Mashed into potatoes or pureed into a soup, these hearty stalks are usually just happy to be eaten. I rarely enjoy them in their whole form, but this recipe is so easy and tasty, it would be a shame not to. These Middle-Eastern Roasted cauliflower are roasted to bring out their nutty goodness, then dressed with tahini and date syrup. The result? One of the most incredible veggie sides I’ve had to date (thanks to BB’s uncle in LA!). Try this for a non-traditional Turkey-Day side or with a quick chicken curry. Preheat your oven to 400 degrees. Roughly chop your cauliflower into 2-inch pieces and spread them out in a baking dish. Toss in olive oil and salt & pepper, then roast for 45 minutes, until they’re golden and crispy. When they’re out of the oven, cover the roasted florets in tahini and date syrup. Don’t have date syrup on hand? Click through for this recipe! Pop them back into the oven for a few more minutes to let all of the flavors come together. Serve warm! Before I get a snarky “whataburger called, they want their recipe back” comment, let me just clarify that this little appetizer resembles nothing of the butter-drenched, deep-fried concoction that you devour at 3am. Although I would nosh on these at 3am- don’t get me wrong. 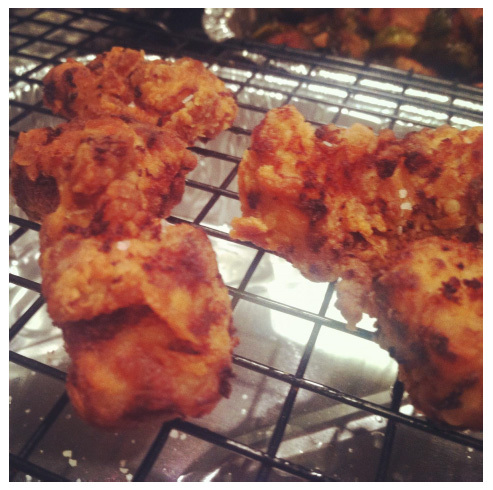 Cut your chicken thighs into 1 inch cubes and cover with buttermilk in a mixing bowl. Add your thyme, whole, and cover. Refrigerate for 12 hours or up to one day. After letting the chicken thighs marinate, drain in a colander to get rid of excess buttermilk. In a separate bowl, mix together flour, paprika, s&p, and garlic powder. 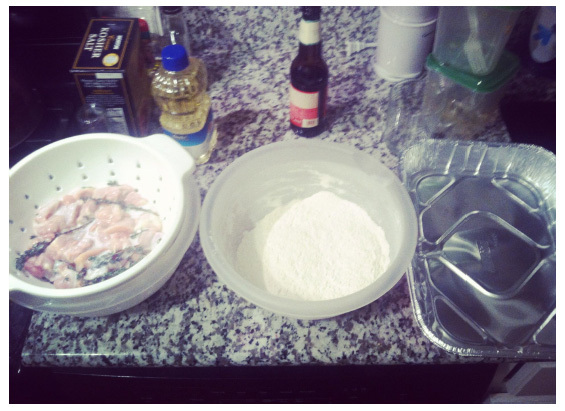 Set up your chicken fritter station with your drained chicken thighs, flour mixture, and an empty pan. Heat your oil in a frying pan to 350 degrees. Then, start your battering & frying process. 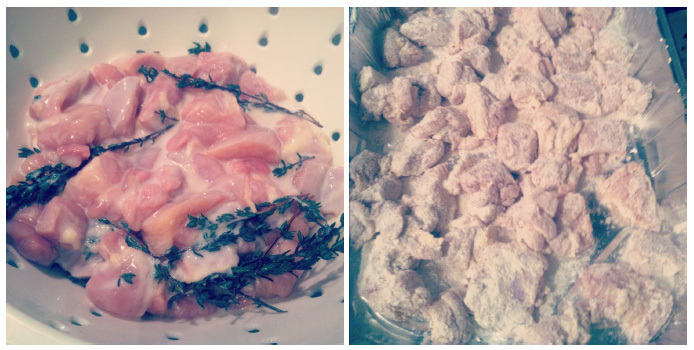 Dredge your chicken thighs in the flour mixture and pop them into the oil. I double-floured mine for good measure. Let the fritters fry until they’re golden brown, or about 8 minutes. Then pop them onto a cooling rack (fitted over a cookie sheet). Do not throw them onto a stack of paper towels! Not even a brown lunch sack, however tempted you may be! Just pop them on the cooling rack and let them drain a bit. I like to season fried things with a pinch of salt after they come out of the oil. Combine the dry ingredients in a mixing bowl. Cut your cold butter into small pieces and work into the flower mixture with your hands until the mixture looks like the consistency of sand. Add your buttermilk and mix until just combined. Turn out onto a floured surface (I used a lot of flour) and knead just a few times until the batter is no longer sticky. Roll out with your hands or a rolling pin (if you’re fancy) into a 1/3 inch thick slab. Use a cookie cutter or a shot glass to make small mini-rounds and lay onto a greased baking sheet. Bake at 450 degrees for 8-10 minutes. Okay here’s the easy part! 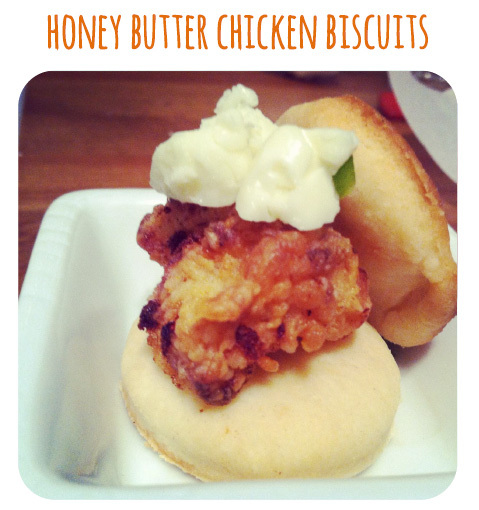 Assemble by topping a biscuit with a chicken fritter and 1 tsp of jalapeno honey butter or roasted garlic sage butter. Now eat it. Okay, now eat another one. Like Hungry Texans on Facebook!